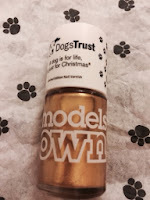 'Dogs Trust' is the nations largest dog welfare charity and they have teamed up with one of the most popular nail polish brands 'Models Own'. This limited edition nail varnish has been created to celebrate the anniversary of Dogs Trust famous slogan 'A Dog is for life...not just for Christmas' and this phrase is still needed in 2014 to highlight responsible dog ownership. The limited edition nail varnish is a gorgeous gold colour, adding a touch of sparkle to your paws. 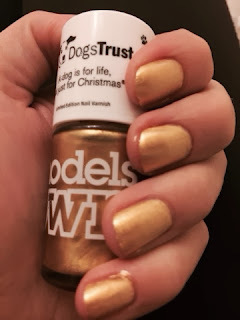 By purchasing this polish you are showing your support to this worthy cause and all the profits from every bottle sold will be donated to Dogs Trust helping to save more dogs. Also remember to get involved with their latest campaign #presspaws asking dog lovers to spread the idea of pausing to think, am I in a position to train and look after a dog for the rest of my life?' By tweeting a paw-touching picture of your pet pooch! I can not do this as although I would love a dog I know at the moment I could not give them the time they deserve! Remember this nail polish is only for human paws!!! !